When you need a guard shack or an in-plant office, you have several options. You could construct the units on site, yourself. While there is nothing wrong with this method, there are plenty of drawbacks. Instead of dealing with the hassle of construction on site, you should consider purchasing pre-assembled buildings. 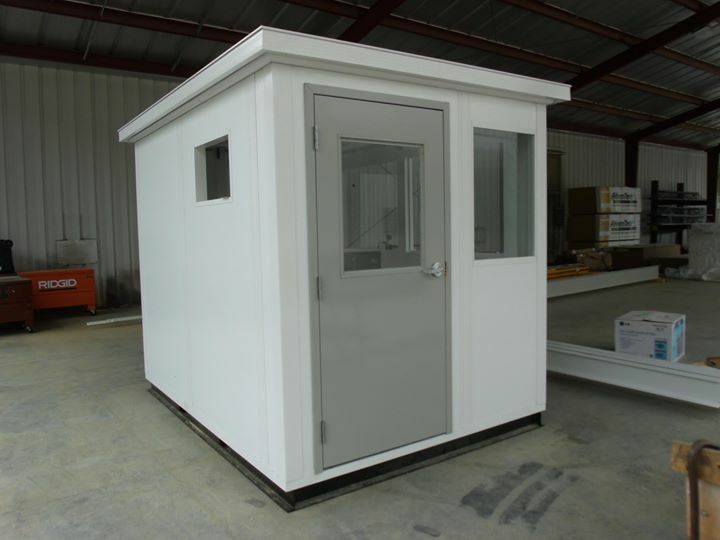 Having a prefab guard shack at your disposal, you have property that can meet several needs. Your prefabricated building will arrive at your preferred destination already constructed. This means all you have to do is install it where you want it. This eliminates nearly all construction on site, keeps your site functioning distraction free and saves you money. 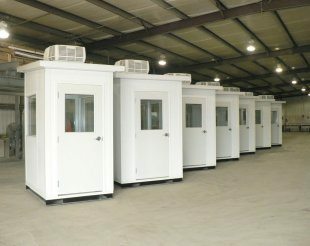 Additionally, because we are able to construct these units off-site at a factory, you can have your guard shack much quicker. In many cases we can ship your guard shack enclosure within five days. An extra benefit to this structure is that your portable guard shack can be moved whenever you need it. The unit is constructed to be structurally secure for transportation. While you can hook your unit up to electrical services, it’s easy to uninstall and transport to a new location if necessary. This is beneficial if you run several construction sites or need to move the unit for public events. Your prefabricated guard shack is flexible as well. The smaller units typically hold one to two individuals and feature sliding windows, a door and shelving, if desired. You can even include a roof-based HVAC system and other features to customize your unit. This means you can use your unit as a ticket booth or gate house as well. The flexibility of these units allows you to save money. Instead of building a permanent structure on site that only has one function, you could feasibly use the same unit for multiple purposes. For companies that routinely work at construction sites or fairgrounds on a short-term basis, this makes it much easier to move around and still have access to protection from the elements for your staff. When you need a flexible structure for your employees, opt for a portable guard booth from Panel Built. When you order a prebuilt structure from us, we ship the unit direct-to-site. Your new booth will be ready to use as soon as it’s completely installed. Expanding your business can be exciting and nerve-wracking all at once. One concern many business owners have is affording the expense of expanding their office space. For many small businesses, extra space is essential to keep growing, but leasing a larger property or remodeling your current location is out of the budget. If you need to create additional space but need to work on a budget, you should consider an in-plant offices. The biggest benefit of an in-plant office is that you get to take advantage of space you already have but aren’t able to use. When most people think of expanding work space, they think building out or wide. But, you can create a lot of extra space by building up. This is particularly true in industrial settings where you usually have very high ceilings. While this creates great airflow and an open feeling, it also gives you tons of extra usable space. When you utilize an in-plant office with a mezzanine you literally create extra room out of thin air. Your mezzanine is designed to hold a lot of weight. This means you can comfortably create an office space, move in furniture and even hold meetings in your office and still feel comfortable. Many companies even utilize the space underneath the office area for extra storage, which means that there is no wasted floor space. In addition to the capability of creating extra space, using an in plant office is almost always cheaper than trying to add additional square footage to your building any other way. Your new office will be mainly constructed off site which significantly reduces the amount of construction that will take place in your industrial space. This means your employees can continue doing their job without concerns for safety or delays. When your new structure is completed we can help install it for you. Your new unit, with mezzanine or without, can be completely installed within hours instead of weeks or even months. You can avoid construction and weather delays by choosing Panel Built to build your new office. These flexible spaces are perfect for offices, storage rooms or break rooms. The units are easy to customize including your choice of windows, doors, flooring and wall options. Your new office does not have to feel cold and sterile, with different options you can make your office feel a little homier by choosing wood paneling or tile for your floor. If you want to keep an eye on your work floor while you work in your office, you can even choose large full-sized windows so you can always see what’s going on. To learn more about office spaces, guardhouses and other prefabricated units we offer, visit our website or call our customer service representatives for a free price quote. When you want high quality at an affordable price, a prefabricated structure from Panel Built should be your first choice.